In less than two decades, large retail chains have become the most powerful corporations in America. 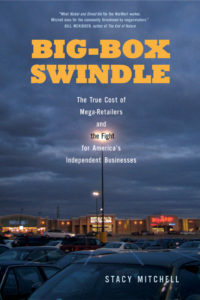 In this deft and revealing book, Stacy Mitchell illustrates how mega-retailers are fueling many of our most pressing problems, from the shrinking middle class to rising pollution and diminished civic engagement—and she shows how a growing number of communities and independent businesses are effectively fighting back. How to get a copy. Big-Box Swindle is available anywhere books are sold. You can order it online from an independent bookstore in your community. If you don’t have a local bookstore nearby, my hometown bookstore, Longfellow Books, would be delighted to ship you a copy. Just place your order here. For wholesale and bulk orders, contact Beacon Press at 617-742-2110.